C'mon, c'mon, come and get it! 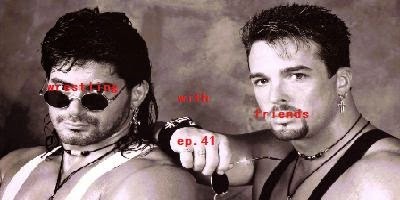 Another episode of Wrestling with Friends, that is! That's right, you're lookin' at the real deal now, because it's all about the power on this jam-packed edition of theme song goodness! Before the Friends get "Wild", they do their duty to bring you up to speed on the latest happenings around the wrestling world—from Rusev's soldier attack to Jeff Jarrett's backdoor dealings with Ring of Honor. The news is a bit limited this week, but that's because the Friends have decided to book-end this episode with the latest Friends Cup; so be sure to stick around to the end of the show! In between, of course, is a lengthy (joint) Wild Card discussion of favorite wrestling theme songs! The Friends kicked things off a few months ago with the start of their Top 30 list, and now they're reaching No. 25-21 with increased admiration and fervor. That's right: FERVOR! So sit back, reminisce and start building your own iPod playlist of some real-life jock jams! Final Song - Rick Derringer, "Teenage Love Affair"